The post 10 Types of Service Dogs and What They Do by Heather Marcoux appeared first on Dogster. Copying over entire articles infringes on copyright laws. You may not be aware of it, but all of these articles were assigned, contracted and paid for, so they aren’t considered public domain. However, we appreciate that you like the article and would love it if you continued sharing just the first paragraph of an article, then linking out to the rest of the piece on Dogster.com. Many dog people would say their canine companions are their best friends, but for a growing number of individuals with specific physical, neurological or mental health needs, different types of service dogs are also invaluable partners in day-to-day life. Legally, these dogs are welcome in places where pet dogs are not. Unfortunately, the practice of non-disabled people passing off pet dogs as different types of service dogs has eroded the rights of real assistance dog handlers, especially those with invisible disabilities. According to Eames, those tasks may be done by a breed who doesn’t fit the popular image of a service dog as a retriever or a German Shepherd Dog. As the list of jobs for service dogs grows, so does the diversity of service dog breeds helping disabled people. A guide dog helps his handler cross the street. Photography by Lars Christensen / Shutterstock. Assistance dogs who lead visually impaired and blind people around obstacles are one of the most commonly known types of service dogs. Labrador Retrievers, Golden Retrievers, and Lab/Golden hybrids are often dog breeds chosen as guide dogs, although other breeds, such as Poodles, can also be well suited to be this type of service dog. 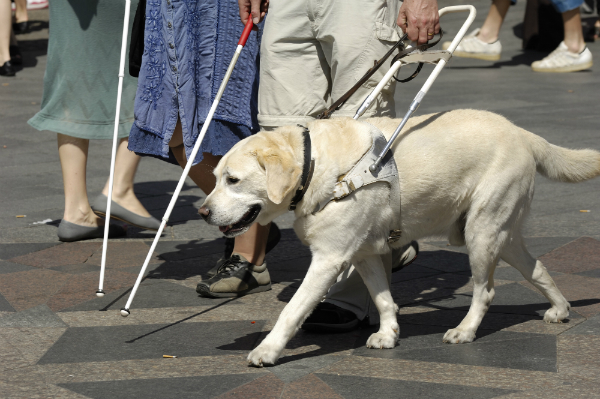 According to the Canadian National Institute for the Blind, guide dogs have been helping visually impaired people for centuries, and their use may date back to Roman times. Many laws and pieces of legislation regarding service animals were original written with an emphasis on guide dogs. While people often expect guide dogs and other assistance dogs to wear vests, the Americans With Disabilities Act does not require a vest, although they’ll often be wearing a special harness with a handle on it. For people with hearing impairments, these types of service dogs assist by alerting their human to noises such as alarms, doorbells, or crying babies. When the dog hears the sound, they’ll touch their human and lead toward the noise. Labradors and Golden Retrievers are dog breeds that are often selected as hearing dogs, but many other breeds, including Cocker Spaniels and Miniature Poodles, have been successfully trained to alert as a hearing dog. According to Assistance Dogs International, small-to-medium mixed breeds acquired from animal shelters are often trained as hearing dogs, with Terrier mixes, Poodles, Cockers, Lhasa Apsos, Shih Tzus and even Chihuahuas being selected for personality and temperament. Mobility Assistance Dogs can retrieve objects and help handlers get around. Photography by dogboxstudio / Shutterstock. 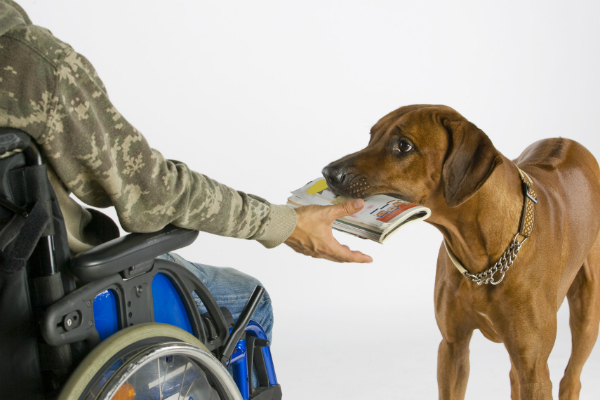 These types of service dogs can perform a wide range of tasks for people with a wide range of mobility issues. According to Service Dogs of America, mobility assistance dogs can bring objects to people, press buttons on automatic doors, serve as a brace for people who are ambulatory or even help pull a wheelchair up a ramp. These dogs help people increase their independence and confidence. People with spinal cord injuries, brain injuries, muscular dystrophy, and arthritis are among those who benefit from being partnered with a mobility assistance dog. Different breeds are selected depending on the handler’s size, but the dogs must be large enough to support their human partner. Also known as DADs, these types of service dogs can provide independence and security by alerting to chemical changes in their handler’s blood sugar. The scent changes associated with hyperglycemic or hypoglycemic events in diabetics are imperceptible to humans, but dogs can pick up on them and alert their people to blood sugar highs and lows before the levels become dangerous. When a diabetic alert dog alerts, his human then knows to test his blood, then inject insulin or ingest a dose of glucose before his blood level gets dangerous. Many of these dogs are trained to go alert others in the household or set off an alarm system if their human needs medical help. Seizure alert dogs are a controversial type of service dog who react with a specific type of behavior right before her human has a seizure. The ability to alert to seizures seems to be a natural ability for a small number of dogs, although some neurology experts say there is no reliable evidence to suggest that dogs can reliably predict seizures. On the other hand, many patients, families and trainers insist their dogs do accurately predict and alert to oncoming seizures, and stories about pet dogs who alert without training have received a lot of media attention. Some epilepsy organizations, like the BC Epilepsy Society, state that it’s not possible for dogs to be trained to alert to seizures, but some dog training agencies (including UK-based Support Dogs and 4 Paws For Ability in the U.S.) say it is possible to train a dog to alert. Not to be confused with seizure alert dogs, seizure response dogs are trained to provide help to a person experiencing an epileptic seizure, not to predict the seizure. These dogs can be trained to bark for help or to press an alarm system during a person’s seizure. They can also get a person out of an unsafe place during a seizure and help the handler to come around when the seizure ends. These dogs may also bring medicine or a phone to a person who is coming out of a seizure. 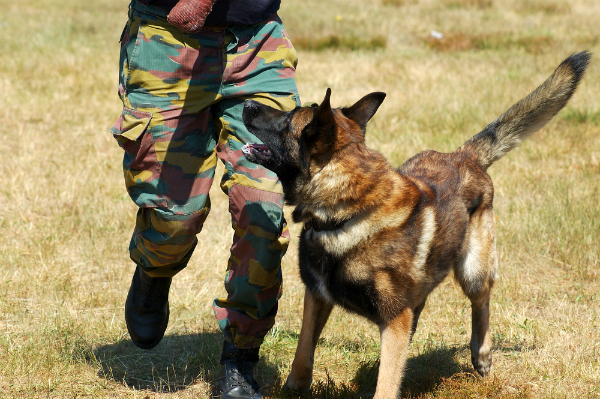 PTSD Service Dogs often work with military veterans. Photography by sam100 / Shutterstock. This versatile category of service dog assists people who are suffering from issues like depression, anxiety and most often post-traumatic stress disorder. PTSD can afflict people after they’ve served in combat, worked as a first responder, or experienced abuse, natural disasters, terrorism and other life-altering events, such as car crashes. The human handlers in this category can feel hyper vigilant about their safety, and service dogs can make them feel safer by doing things like entering the home before the human, and turning on the lights with a foot pedal. These dogs can also help PTSD sufferers who feel overwhelmed in public places by creating a physical barrier between the handler and others, giving the handler more personal space. Many PTSD sufferers find that having a service dog to care for forces the human to also take care of themselves, by getting out into the world and getting exercise with their dog. Dogs can provide a social bridge for kids with autism. Photography by lassedesignen / Shutterstock. For kids on the autism spectrum, these types of service dogs help provide a sense of predictability as the children navigate social settings, including school. The dogs can be a big help for kids who have trouble connecting with classmates, as the canine acts as an icebreaker in social situations. 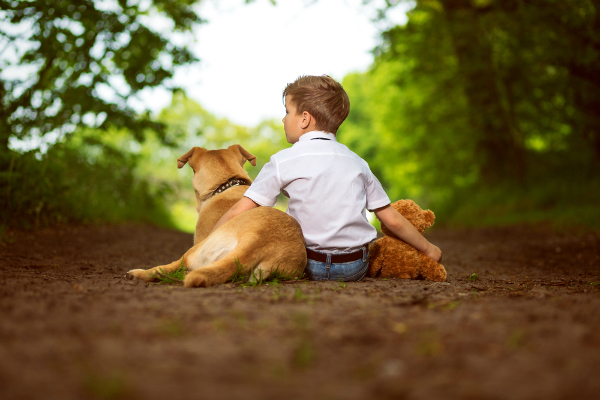 In addition to improving the child’s quality of life by reducing isolation and comforting the child in stressful times, these dogs are also trained to keep children from running away and can often track children if they do run off. An emerging category of service dog, these dogs support children who were exposed to alcohol prenatally, and have been diagnosed with fetal alcohol spectrum disorders (FASDs). These children may have physical and mental difficulties, as well as behavioral problems and learning disabilities. According 4 Paws for Ability, its FASD dogs are trained similarly to autism service dogs and can be trained to interrupt a repetitive behavior. 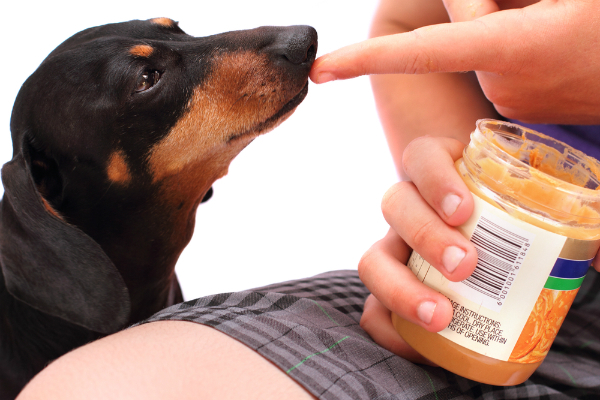 Allergy Service Dogs are trained to sniff out peanuts. Photography by dogboxstudio / Shutterstock. With the rise in food allergies has come another type of medical service dog. Allergy detection dogs are trained to sniff out and alert to the odor of things such as peanuts or gluten. Often partnered with children, allergy detection dogs can be trained to alert to allergy-inducing smells at school, providing the kids with a greater sense of independence and giving their parents a greater sense of security. While it’s clear that some dogs can be successfully trained to alert for allergies, this category of service dog attracted negative attention when some parents said they paid for dogs that couldn’t care less about a deadly peanut. Other kinds of working dogs, including therapy dogs and emotional support dogs, are not classified as service animals as they’re not trained to perform a specific task to help their handlers. In most jurisdictions, these kinds of dogs are not afforded the same privileges as service dogs. Thumbnail: Photography by Chuck Wagner / Shutterstock. This piece was originally published on March 9, 2018. About the Author: Heather Marcoux is a freelance writer in Alberta, Canada. Her beloved Ghost Cat was once her only animal, but the addition of a second cat, Specter, and the dog duo of GhostBuster and Marshmallow make her fur family complete. Sixteen paws is definitely enough. Heather is also a wife, a bad cook, and a former TV journalist. Some of her friends have hidden her feed because of an excess of cat pictures. If you don’t mind cat pictures, you can follow her on Twitter; she also posts pet GIFs on Google+.